The latest news from the IPL — that is, off the field — is full of intrigue and scandal. Taxmen raiding the IPL offices (or not raiding, Lalit Modi insists, but simply turning in for a stroll)? The Cochin team putting in a bid with backers who didn’t know what they were backing? Twitter twitter? Of course, we don’t know if anything illegal has taken place. We don’t know much about anything, really; the BCCI and the IPL are hardly paragons of transparency. But I wanted to just pass a little note about how badly I feel about the ICL’s demise. It always struck me as patently unfair that a group of athletes could not organize themselves and practice their trade without the BCCI’s authorization. The specter of the ICL belies any claim that the IPL is a triumph of the market; if the IPL is winning, it did so by quashing the competition, not engaging it. I don’t know if the market could have tolerated two Twenty20 leagues. But I think there would have been so many other benefits (Econ 101 tells us enough about that). In the IPL, we have a situation highly prone to conflicts of interest and corruption: one man controlling access; huge amounts of money; shifty politicians (and I hate to count Shashi Tharoor in this group, but what is the matter with this man?) hanging around. Conversely, when Mr. Lockerbie, who dreams of bringing T20 to America, calls it “home run derby meets running bases,” he means that as a good thing. And many English fans would agree. Introduced in 2003 to boost the fortunes of the flagging lower-level “county game,” which is the domestic league below the international teams, T20 succeeded at its mission; grounds filled up and the format was accepted as the kind of harmless AAA sideshow the late-baseball owner Bill Veeck, creator of the exploding scoreboard, might have come up with if he had owned a cricket team. Good stuff. There’s also some interesting figures about IPL wealth. Read the whole thing. Indeed, all the noise and colour associated with the Twenty20 “spectacle” is a clue to its essential emptyness: you need all this nonsense to distract the audience and prevent it from realising that that there’s very little that’s interesting actually happening on the pitch. High church cricket fans might be depressed if the game were sold to an abbreviated format that was, nonetheless, superior to the traditional forms of the game, but it’s quite another thing entirely for the game to be bought and soldto promote a markedly inferior, less compelling, less textured and varied form of cricket. And yet that is where our current masters are taking us. It is madness. I’d only add a brief amendment to Massie’s argument. One of the big joys of Test cricket’s interminable length is that it allows the audience to keep the game in a pleasant background. You go to watch the game, obviously, but you also go to relax, read a book, and have the general hum-drum of leather and wood around you. Twenty20, however, is the opposite: it’s an all-out assault on the senses. Even if the on-field action doesn’t include a boundary or a wicket, there’s music, cheerleaders, interviews, and the like. You just can’t look away, even if you want to. It’s really not cricket at all, but hyper-entertainment. Regular readers will know I don’t have much love for the IPL, or Twenty20 for that matter. I thought the last tournament went on too long and, even though I’m glad cricket viewership increased, I thought the franchises were made-up and the amounts of money thrown about ill-considered. The latest move to off-shore the tournament to South Africa, though, is an interesting experiment. The IPL began with a big first challenge: will cricket fans root for teams that did not exist before and have only the barest connections to their host cities? Why would, say, a Jaipur resident support the Rajasthan Royals, given that the captain is Shane Warne, who is clearly not Rajasthani? At the time, I didn’t think it would work out, but apparently it did. I can’t end this preview without mentioning the New Zealand cricket board’s hospitality in allowing six of the Indian test playing squad to play in the domestic tourney. It’s an incredible gesture, and one that Vettori will probably curse if Dravid or Laxman grind them down, but no praise is high enough for the board. India have always started poorly on the road, and playing no practice matches in alien conditions is usually a recipe for disaster for India. You can’t but compare the New Zealand board with India’s own petty mandarins who insist on excommunicating every bacterium that has every been within a five mile radius of the ICL. Power does corrupt, and it’s an ugly sight to see the BCCI hypocritically treading down the same autocratic path it has decried in the past. The league’s announcement drew political repercussions on Sunday. The main national opposition, the Bharatiya Janata Party, which has consistently attacked the governing Congress Party-led coalition government for being weak on terrorism, criticized it up for failing to guarantee security for cricket. Homer and I engaged in some fairly live back-and-forth about whether or not the IPL means something, and whether or not it would hurt if it were postponed for safety reasons. I think the exchange is worth a read. Is Cricket and the IPL Recession-Proof? Leading sports are, by and large, standing up to recession better than most. They have two advantages. It helps, first, to be able to sell broadcasters and sponsors what they crave in a world of myriad channels: lots of dedicated viewers…The other advantage is timing, which is just as important in the business of sport as it is on the field of play…The IPL, for instance, started out with a ten-year, $1 billion agreement. Later in the article, one analyst said the IPL would survive any economic woes, but English county cricket may suffer more (different markets, different pressures). Ajay Shankar had a more pessimistic take on the IPL’s economic status last month. He noted that a variety of sponsors were trying to renegotiate or even pull out of deals. My Two Cents made a rousing pitch for keeping the IPL on schedule this year, even as the tournament faces doubts from foreign cricketers and the Indian government as well, jittery about election season. As Harsha Bhogle recently noted, the whole gig’s up in the Twenty20 rivalry: the ICL pretty much lost, and the IPL won. 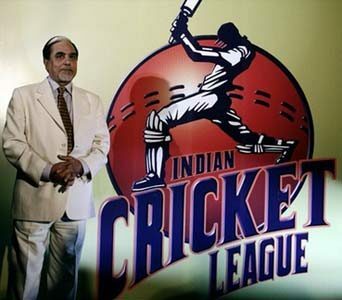 No one has money on hand right now, not even Zee’s ever-resourceul chairman, so the IPL and its bosses might as well smile on the puny ICL rebels who dared to leave broken domestic careers for a somewhat lucrative gig. But no. Not only will the the BCCI refuse to strike a deal with the ICL, it even refuses to countenance its existence: witness the recent fracas in New Zealand, with Sachin Tendulkar and Dinesh Kaarthik prevented from playing in a Twenty20 because Hamish Marshall (who?) would be present.